If you need an accurate floor plan then OrthoGraph is the solution you need. But the so called point clouds are also great tools in the building surveying industry. You can read more about the comparison of the floor plans and point Clouds here. OrthoGraph can also read and handle point clouds created by Point Cab. These point cloud files can be imported to OrthoGraph as background pictures. OrthoGraph is the ultimate solution to create industry standard floor plans from your point clouds. How to use point clouds in OrthoGraph? 1.) First import your point cloud file via DropBox. You have to select your file that you have previously created with a laser scanner. 2.) When the pictures have loaded in than you will see only some tiles from the whole pictures. It is caused because the large size of the point cloud files. You have to hide the tiles you don’t need and you have to display the tiles that are necessary for creating the floor plan. 3.) Normal background pictures need to be calibrated but point clouds are different. They contain dimensional date, so you do not have to measure your point cloud picture. 4.) You may need to change the wall thickness. 5.) 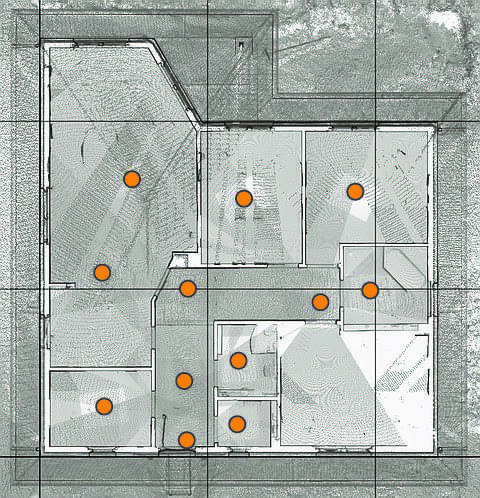 You can simply start drawing the rooms and position the corners with the corner moving tool. Get OrthoGraph and start using the app!